Time to post a birthday card. Now that all of my girls are in school they are starting to get party invitations. I thought I better start making a few cards to have them on hand when I need them. 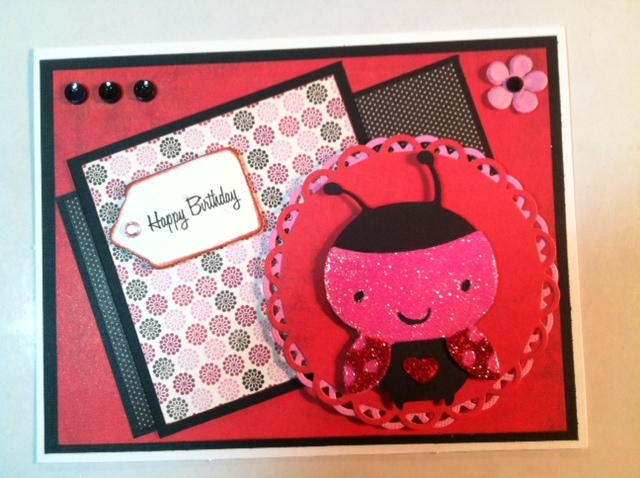 One of my favorite cartridges is Create A Critter, so I decided to use this cute little ladybug. With the red and black I added lots of pink to make it more girly. I love doing glitter and then adding Glossy Accents on top of the glitter. When you put Glossy Accents on top of the glitter it keeps the glitter from falling off of your project and getting everywhere, but don't worry you can still see all the sparkle! Enter our 500 Follower $100. Joanns Gift card Giveaway! Too cute. Love the glitter and glossy accents. oh and you have the most beautiful blog!!! I love those halloween characters falling on the page!! eeek! I am having a 250 follower giveaway going on today and yesterday posted a Thanksgiving free digital..( a little girl praying, giving thanks )hop over if you are interested!!! Adorable. Love the Create a Critter cartridge too. Adorabel Bday Card! !Sweet Little Critter!Love the Glitter. so adorable love all the sparkle! Adorable card! Love all of the sparkles. awww Tara this is really cute! I love the colors and glitter. Aww..this is oh so cute!! Love the glittery bug! So sweet! Super cute.love the glitter paper on bug.Great LO. Card is just too cute. Thanks for joining Link Up for Pink. Tara, I love this card!!! Your offset matting looks amazing!!! And the little ladybug is adorable! I can't wait to get my hands on this cartridge!!!! Thanks for entering my birthday giveaway!! Good luck!